-- The Story of Tea, p.294. It is downright freezing in my house today despite being the middle of October , so I am happy to be experimenting with some new tea blends (using as a base the Sri Lankan green that I wrote about here) and drinking lots of hot tea. This photo was taken in Daylesford about 6 weeks ago, but the weather's not much different today! As I have discovered over the last six months or so it is not actually that simple to create green tea blends using only natural herbs and spices (as opposed to flavourings/essences, whether natural or artificial in origin). 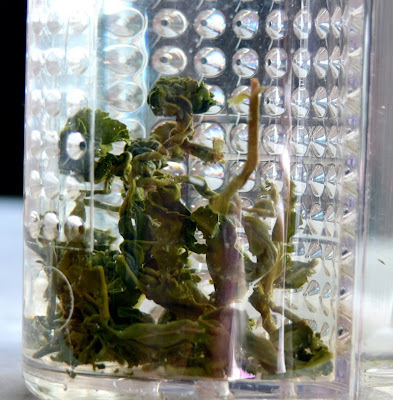 This is primarily because of the different brewing temperatures and times of the different components: green teas generally yield the best results from short steeps at a lower temperature (around 80 Celsius), but herbs and spices need higher temperatures and longer steeping times to release their flavours properly. So it's not as easy to create a really lovely tasting green tea blend as it is to create a black one where the temperature and time factors are more similar. My first trial batch this morning is a Moroccan mint-type blend (using dried herbs obviously, instead of fresh ones as I did the other day) of green tea, peppermint and spearmint. In the interest of scientific curiosity (and not freezing to death) I decided to try brewing two separate pots, one with water straight off the boil (yes, I know... I shuddered merely thinking about it but I did it anyway; that's just how intrepid I am) and another with water cooled for 3 minutes or so to about 75-80 Celsius. Unfortunately I don't have two teapots of exactly the same type and dimensions, but I did my best to keep the proportions of tea and water the same - 2 rounded metric teaspoons to about 400ml water, steeped for about 2 minutes. Both teas were quite tasty (I think at least partly owing to the fact that the mints are powerfully flavoured in their own right and so probably relatively well-suited to brewing at different temperatures) but I preferred the one brewed at the cooler temperature. I'm hoping this isn't just my innate prejudice regarding the 'proper' way to brew tea; I really did try to keep an open mind and was even sort of hoping that the boiling water one might turn out better. But it had a strange kind of metallic taste to it that wasn't present in the other... not very pleasant. So once I get this blend up in my shop I will definitely be recommending that it be brewed with cooler water. Put the mint leaves into a 2-cup teapot and steep in the boiling water for 3 minutes. Add the gunpowder green tea and steep for a further 2 minutes. Have the honey in a heatproof jug and after the tea has steeped, strain it into the jug and stir well to dissolve the honey. You can drink this hot as it is, or if you would like something a little cooler, add about a half a cup of ice cubes and stir til dissolved (this brings it down to about room temperature), or otherwise let it cool and then refrigerate for later. I have been trying to ensure that I don't buy any new tea for personal use until I have worked through more of my current supply... but I did end up adding a couple of small packets of organic green teas to my latest order from Southern Light Herbs (which is where I get most of my tea and herb supplies for my Etsy store). The main reason that I haven't added any green tea blends to my shop thus far is because I haven't been able to find a green tea that works well enough - or is nice enough - as a base. I have previously tried the organic Japanese green from SLH but found this to be a major disappointment - much too toasty for my taste, and the leaves were rather pale and I just didn't like it. This time, however, I ordered the 'Sencha', which is from China (so is probably more accurately described as 'sencha-style') and the generically named 'green tea' from Sri Lanka. I have never had a Chinese 'sencha' or a Sri Lankan green tea before, so I was intrigued to see what they would be like. Both were described in the catalogue as 'rolled leaf' but as you can see each looks considerably different from the other. The one to the back is the Chinese 'sencha', which has dark but very green leaves that are flat and smooth. The leaves at the front are the Sri Lankan green, with longer, loosely rolled and twisted leaves in a variety of shades of browny-green, quite different to the deeper 'steamed' green colour you get in a sencha. The sencha leaves have a good grassy scent and it compares well to my current favourite sencha (which I usually get from Asian grocery stores, the brand is Ujinotsuyu) in terms of both look and smell. The Sri Lankan green smells almost herbal; a little minty perhaps? I brewed both the teas approximately the same way: 2 teaspoons (a bit more difficult to measure in the case of the Sri Lankan, given the size of the leaves) in about 300ml water at about 65 degrees Celsius (thereabouts); steeped for one minute only. The Chinese sencha produced a very clear, pale green/slightly yellow infusion with a mild, faintly toasty aroma. The flavour likewise was mild and faintly toasty, but in a pleasant way (I have a low tolerance for strongly toasty/roasty tasting teas). The tea as I brewed it today seems to lack any appreciable sweetness - this is not to say that it's bitter or astringent, because it isn't, but it doesn't have a noticeable sweet aftertaste that sencha (amongst other teas) often has. Mind you, I could have brewed it more strongly, and I did have a fairly strong-flavoured lunch a couple of hours before, so both of these factors could be influencing my perception of the tea. The Sri Lankan green had a similarly pale clear liquor, perhaps slightly more green than the Chinese (not that this comes across in the photos really). The aroma of the Sri Lankan is faintly flowery, almost a bit like an oolong. The flavour is, like the Chinese, very mild - but apart from this factor, completely different and rather interesting. It's a little savoury at first, then at the back of the palate a touch of the floral-oolong-like note appears. The wet leaves also don't appear to be fully unfurled, suggesting that a longer initial steep, or a second steep following a short first one, would work well. I like both of these teas, and I'm especially excited by the Sri Lankan green which is rather different to anything I've had before. I will need to experiment further to see whether either of them is suitable for blending with other flavours, but fingers crossed, I will be able to develop a few good ones! Well, not exactly iced - it's a little too chilly for that today, although the sun is now out - but I did cold-brew a jugful using the last of my T2 oolong, garnishing it with chopped pears and sliced blood orange to serve at room temperature this morning. The orange slices were a lovely addition, especially after they'd been steeping in the tea for a few hours. As I think I have said before the T2 oolong is not a terribly exciting one - it's pretty heavily roasted and not particularly fragrant or anything like that, but it does cold-brew nicely, and is also very pleasant hot - can even withstand a few infusions. I won't be buying it again in a hurry; but it is a useful 'everyday' type of tea to have around. Another thing I like to use the T2 oolong for, actually, is to add a tablespoon of finely-ground leaves (which I do in our small mortar and pestle, they're pretty dry and crumbly and grind down very easily) to a banana smoothie. I first got this idea from the Teas.com.au website - they recommend using their White Dragon Oolong, but I've never tried that particular tea. I like to add a sprinkle of ground cinnamon to the smoothies I make with the T2 oolong - the flavours seem to complement each other nicely. Sometimes I use soy, sometimes regular milk, depending on what I have on hand - both are very tasty (I suspect almond milk would be too). This makes for a great breakfast drink or snack. Given that the recipe calls for quite a substantial amount of dry leaf, I'm not sure if I would like to make it with an oolong or other tea that I really loved drinking on its own, or that was very expensive, but for a middle-of-the-road-okayish kind of tea, it's a good use. Cold brewing Long Feng Xia (2008) oolong from Tea from Taiwan in my Bodum iced tea jug. A beautiful flowery fragrant tea.